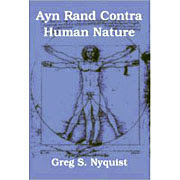 Ayn Rand Contra Human Nature: The Shorter ARCHN: Chapter 2, "Theory of History"
These expansions of state power are arrangements that have little or nothing to do with ‘altruism’ or self-sacrifice, and everything to do with the exercise of politics for self-interest and mutual advantage. I think that Rand/Peikoff mean is that such arrangements are made by reference to self-sacrifice. ie, a government bureaucrat will justify a restriction "for the common good." They never come out and say "We're taking your freedom so I can have more money in my wallet." That's what they mean. In fact, the quote from my last comment is not controversial to Rand or Objectivism. In "Atlas Shrugged" there is an entire subplot about the rich heirs of a factory who enacted a system for the alleged "virtue" of self-sacrifice in order to pad her own pockets with said sacrifice. Calls for self-sacrifice are usually always thinly veiled grabs for power or money. Rand and other Objectivists have said this for decades. It's not some new insight that Objectivists missed. What Objectivists are saying is that the reason this works is because the mass public (mistakenly) thinks self-sacrifice IS a virtue. Didn't Ayn Rand go beyond that? Didn't she call concept of alturism itself is immoral? Yes she absolutely did. I was just responding to Greg's point that politicians aren't explicitly motivated by altruism. They just echo back what the public wants to hear. Many a "common man", however, do find self-sacrifice to be a noble endeavor. This makes pandering to altruist sentiments an effective political power grab. So what do you think politicians (in general) are motivated by? If not alturism? Does this mean then you believe those acts of self-sacrifise made by some Germans to save the Jews during the Holocaust not be noble? Or were those Germans being selfish by risking themselves to save the Jews? Don't you think the reason this works is because the mass public (mistakenly) see the consequence of the selfish motivation of politicians and their lobbyists as something worthy of self-sacrifise on their[the mass public] part? Do politican get endorsement and money from the "common man" of the organized labor by pandering to their alturist sentiments? do they get endorsement and money from the "common man" of the organized labor by pandering to their selfish sentiments?